I am a mother who swore no guns. 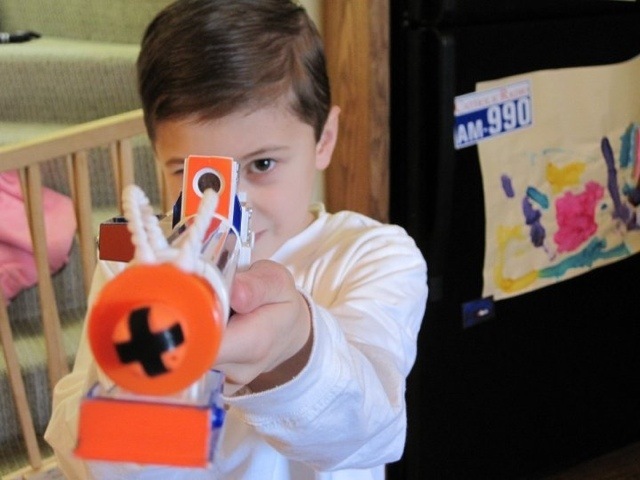 But that changed, and I ended up buying a five-year-old Henry a toy arsenal when I surrendered to the fact that my disdain for guns and violence was not his. Here’s a shocker. Boys are different than girls. And don’t let anyone tell you otherwise. Both of my boys came out of the womb making blow-up noises and shooting me with their fingers, bananas, toast, sticks, you name it. They also came out loving and cuddly and sweet. Loving and full-body slamming are not mutually exclusive. Embrace their spirit. Channel it for good. Help them become the protectors and warriors they are meant to be. This is a great piece by Msgr. Charles Pope. Watch the video.